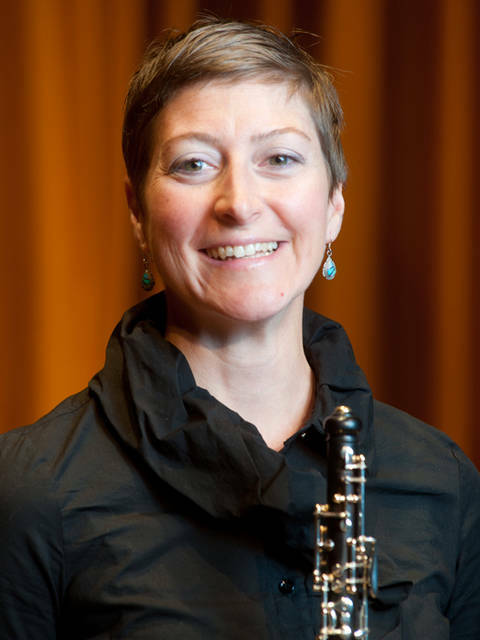 Dr. Christa Garvey, Professor of Oboe, has taught at the University of Wisconsin, Eau Claire since 2003. Her degrees are from Indiana University and the University of Colorado. Dr. Garvey is a frequent recitalist, orchestral oboist, and chamber musician. She is principal oboist of the Chippewa Valley Symphony Orchestra and Eau Claire Chamber Orchestra, and founding member of the Virtualosity Ensemble. Recent performances include a solo recital in Tokyo, Japan at the 2015 International Double Reed Society Conference, numerous solo and chamber ensemble performances on the Live from the Chazen recital series broadcast on Wisconsin Public Radio, Presentations at the 2012 College Music Society National Conference, the 2012 International Double Reed Society Conference, and performances at the 2011 NACWPI 2011 National Conference and a summer 2010 concert tour in Germany with the Sonora Reed Trio. She is also the State Chairperson for the National Association of Wind and Percussion Instructors (NACWPI). Dr. Garvey continually questions what it means to be a modern 21st century musician and has made exciting transformations in the areas of entrepreneurship and innovation. For instance, the Virtualosity Ensemble uses technology to rehearse in an online environment while the members have been over 500 miles apart. Other projects include oboe demonstrations on Youtube, a well-regarded blog about oboe pedagogy (www.theoboist.blogspot.com), and Oboe For Everyone (www.oboeforeveryone.com), a network of teachers and teaching resources that match expert teachers to any student in the world, regardless of a student's ability to pay for lessons. The program has been an immediate and outstanding success, with participants from around the globe.